･The screen display of the route map has quickened. ･New station/Musashikosugi Station is added to the JR East Yokosuka Line. ･The route map became and cooperation with CHIBA & SAITAMA route map became possible. It is 'TOKYO x KANAGAWA Route Map' that covers JR, the subway, and the private railway in Tokyo and Kanagawa Prefecture. JR, the subway, and the private railway in one capital one prefecture are collected. TOKYO x KANAGAWA Route Map targets all areas in Tokyo and Kanagawa Prefecture. ･Expansion reduced display of route map (original). ･Choice is possible from 25 railroad companies. 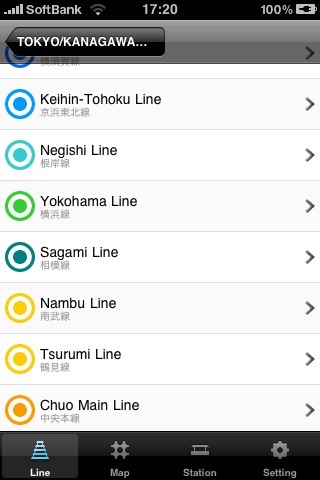 ･Each route can be selected from the railway company further. 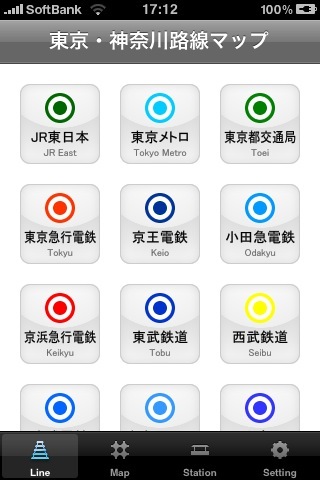 ･Each route is a display of the station name (Japanese and English) and the transfers. 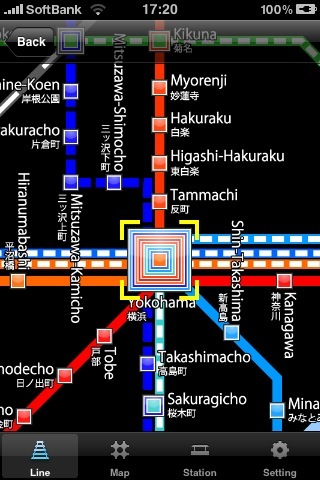 ･The route map covers the subway (metro, toei, and Yokohama Subway). ･It is also possible to change to "Display only of Tokyo Metro and Toei Transportation (Bureau of Transportation of the Tokyo Metropolitan Government) " on a set screen. ･As for the route map, cooperation with another area (CHIBA & SAITAMA Route Map) is possible. ･Any Japanese and English correspondence. ･The fixed display function of length and side is provided. ･TOP screens can be selected and either of Icon or List be selected. ･The map kind of selection can be done. The display only of only Tokyo and Kanagawa is also possible though default is Tokyo and Kanagawa. Moreover, because the route map is made easy to see, the setting of a metro, an under metropolitan management emphasis (subway), and other emphasis (JR and private railway, etc.) is possible the display. ･As for the map base, the display of the base corresponding to the map kind is possible. As for the metro, eight bases and Tokyo and Kanagawa can select 12 bases and Kanagawa from four bases in 5 bases and Tokyo. ･Because data is large, the route map might be driven for a few seconds until being displayed. Please acknowledge it.